‘Surely,’ they said, ‘we are being punished by God for what we did to Joseph. We saw how distressed he was when he pleaded for his life but we would not listen; that’s why this distress has come upon us.’ (Genesis 42:21) So it was clear to Joseph that his brothers knew they had done wrong and deserved to be punished. But had they reformed? Where they any different now? He had to find out before disclosing himself to them. No doubt, he did not want his brothers around him if they were evil men capable of evil acts. On the way back to the land of Canaan they stopped to rest and feed their donkeys. One of them opened his sac to give fodder to his donkey and to his dismay saw the silver he had paid for the grain in the mouth of his sac. ‘What is it that God has done to us?’ they said trembling. 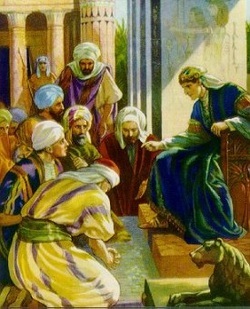 Indeed it seemed that they were now going to be accused of stealing Joseph’s money. When they arrived back home they told their father everything that had happened. Then they opened their sacs. In the mouth of each was the silver they had paid for the grain. Then they and their father were frightened. They were afraid, not only of what awaited them if they returned to Egypt but what God would do to them. That weighed on their minds most of all because they realised that what they did to their half brother Joseph, God knew about it and was now punishing them. They shook with fear at the thought of returning to Egypt for they could not go back without their youngest brother, Benjamin. And once there they imagined that they would never return to the land of Canaan. But the famine became worse and worse. Two years passed and they had consumed all the grain they had carried back from Egypt. They had to return to Egypt or die in the land of Canaan for they had little food left to eat. At first, their father Jacob refused to let them return with Benjamin but they said we cannot go back without him. At last, seeing that they all faced starvation Jacob, their father, gave in and allowed Benjamin to go with his brothers to Egypt. At this, Joseph’s brothers were terrified. They immediately thought it was because of the money that they had found in their sacs. They had not stolen it but it seemed to them that someone was trying to frame them and make them into slaves. ‘He wants to attack us and overpower us and seize our donkeys,’ they said. They hurriedly spoke to the steward and explained how they had found the silver in their sacs. ‘We don’t know how it got there,’ they said. When Joseph came home they bowed down before him and presented him with gifts. ‘How are you and how is your father? Is he still living?’ he asked. ‘Our father is well,’ they replied, and they bowed down to pay him honour. ‘God be gracious to you, my son,’ he said. At seeing Benjamin Joseph was deeply moved and went out of the room to weep. His heart was disturbed. How he had longed to see him and how he had missed his father’s house. Joseph had suffered so much in Egypt, too, but now he was like a prince. He had a wife and two sons. Did he really want to be close to his brothers who had sold him as a slave and hated him? What might they do to Benjamin who was also their half brother? But Benjamin was Joseph’s blood brother and he loved him. Would they do the same to Benjamin that they did to him? All these thoughts went through his heart and mind. He was cautious. This was not the right time to tell his brothers who he was. He had to test them further and maybe rescue Benjamin from them. So he formed a plot to have them arrested on their way back to the land of Canaan. He told his stewards to place his personal silver cup in Benjamin’s sac and send them on their way. Q.1 Do you think Joseph’s brothers deserved to be punished? Q.2 Do you think Joseph’s brothers repented of their sins? Q.3 Why did Joseph order his steward to put his silver cup in Benjamin’s sac.